2014 AOU Check-list Supplement is Out! As a general policy, the NACC accepts as additions to the Check-list any species the American Birding Association’s Checklist Committee (ABA CLC) adds to its list that are not already on the AOU’s list. See the ABA CLC’s annual report in the Nov/Dec 2013 issue of Birding for details on those species. Likewise, the ABA CLC automatically adopts all taxonomic changes accepted by the NACC. You can read all the proposals on which the NACC voted this year by visiting its webpage. Species marked with asterisks below are those which do not appear on the ABA Checklist, either because there are no currently accepted records in the ABA Area or because they are non-natives which have not yet been admitted to the list. When a split is discussed, the species that retains the scientific name of the “old” lumped species is listed first. These days, you can assume that any change in taxonomy is due (at least partly) to analysis of new genetic data, so that is not always mentioned below. Recent genetic studies have looked at the relatedness of the New World “big rails”, that is, what we have traditionally known as Clapper Rail and King Rail. King Rail was split into two species, and Clapper Rail into three. (For an article on the different “Clapper Rails” in the ABA Area, check out the Sep/Oct 2013 issue of Birding.) Finally, Robert Ridgway has an English bird name to celebrate his storied contributions to North American ornithology! Ridgway’s Rail includes the “California” (obsoletus), “Yuma” (yumanensis), and “Light-footed” (levipes) subspecies, plus others further south in Mexico. Any “Clapper Rail” observed in California, Nevada, or Arizona is now this species. The name “Clapper Rail” was retained for the birds on the east coast of the U.S. (this species also extends partially into Middle America and the Caribbean), but its scientific name has changed. 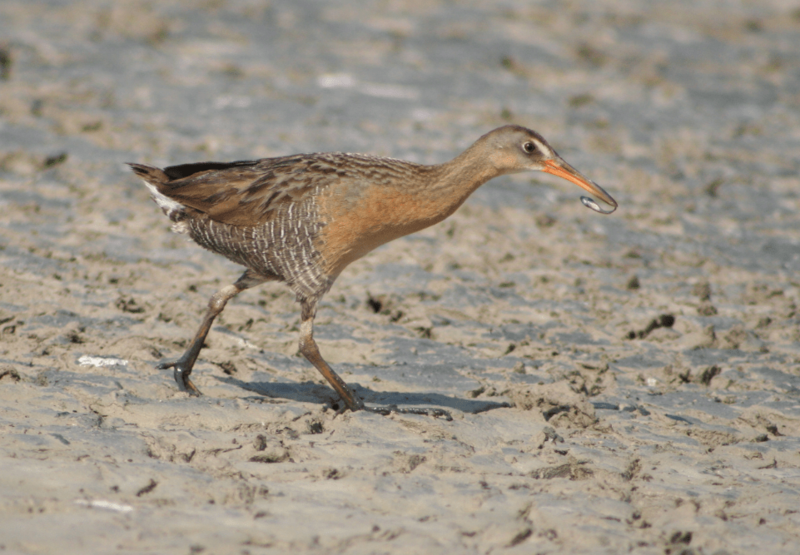 Mangrove Rail is thought to be restricted to coastal South America. Ridgway’s Rail. Sinaloa, Mexico. Photo by © Marco Antonio González Bernal. “King Rails” found in freshwater marshes of interior and western Mexico are now split as “Aztec Rail”. The large rails of freshwater marshes in the eastern U.S. and Canada retain the same scientific and English names. These three species are almost identical in appearance but differ markedly in voice. That makes it extremely difficult if not impossible to identify sight records of silent migrants. And most migrants are unfortunately silent. It is thus unknown which species are represented by many records of migrant birds on Alaskan islands and in western Canada, the Lower 48, and Mexico. For details on differences among the three species, see Howell et al.’s Rare Birds of North America (2014). (They speculate that Kamchatka Leaf Warbler is rare to very rare as a migrant on the western and central Aleutians.) Also check out this website, where you can listen to the different vocalizations, and this one, which nicely shows their breeding ranges.The “new” Arctic Warbler is the species that breeds in Alaska, so if you’ve seen an Arctic Warbler in Denali National Park, then you’ve still seen an Arctic Warbler. The Supplement lists four records of the “new” Arctic Warbler for California and states that Kamchatka Leaf Warbler is casual in the Aleutians and that two records from the Northwest Territories are not conclusively identified to species. Japanese Leaf Warbler has no confirmed records and is not placed on the Check-list. Note that the newest edition of the National Geographic field guide mentions and illustrates xanthodryas, but the authors are really referring to what we today call examinandus.Kamchatka Leaf Warbler (examinandus) and Japanese Leaf Warbler (xanthodryas) were formerly considered the same subspecies (xanthodryas) of Arctic Warbler. So Kamchatka Leaf Warbler first became its own subspecies, and now its own species—quite a graduation! All three of the “Shy Albatrosses” nest on islands of the south Pacific; any appearances they make in the ABA Area are as vagrants. Most records pertain to White-capped Albatross, of which there are a handful of records off the Pacific coast of the Lower 48. There are two of Salvin’s Albatross in the ABA Area—one from off the Aleutians and one very recent record from off central California. (There is another from Hawaiian waters.) Chatham Albatross is not yet confirmed for the ABA Area, but it may be added to the Checklist before long. Two records of (perhaps the same young) Shy Albatross off California are currently being reevaluated after Howell re-identified it/them as Chatham Albatross based on (orangeish) bill color. The AOU is waiting for the ABA CLC to act on this record. 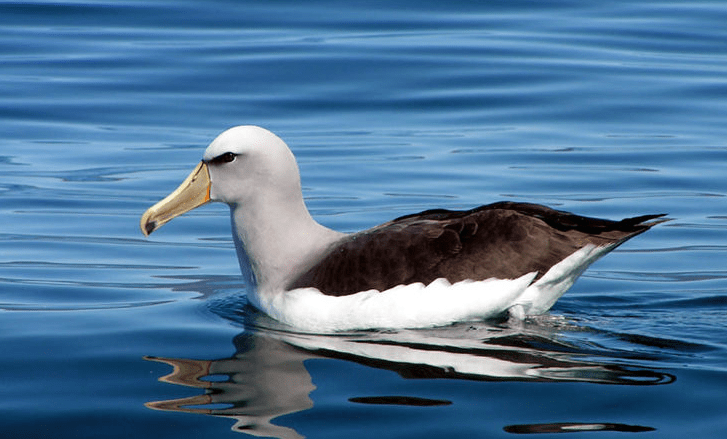 For more on these albatross species, their identification, and their records within the ABA Area, see Rare Birds of North America; Steve Howell’s Petrels, Albatrosses, & Storm-petrels of North America (2012); and the current National Geographic field guide. Salvin’s Albaross. Photo by Arthur Chapman. This split separates resident Ninox owls of southern Asia (scutulata) from the highly migratory ones of eastern Asia (japonica); the latter are now called Northern Boobook. The two also differ in voice. Two records of Northern Boobook exist from Alaskan islands. Lonchura punctulata, added to the ABA Checklist just last year, has had its English name changed from Nutmeg Mannikin to Scaly-breasted Munia. It has long been known in the pet trade as “Spice Finch” or “Nutmeg Mannikin”, but neither name is now widely used by ornithological authorities. The species has no particular association with nutmeg (or other spices), or even Indonesia’s Banda Islands whence nutmeg originates. For largely extralimital species, the NACC generally follows regional authorities on issues of common name usage. Almost all other taxonomic authorities call this species Scaly-breasted Munia, and thus, the AOU has followed suit. This change also has the benefit of eliminating some potential confusion among birders who, when reading “mannikin”, may mistakenly infer a relationship with the neotropical manakins of the family Pipridae. The black-hawks of the genus Buteogallus have lost the hyphen from their “last name”. This affects three species: Common Black Hawk, Great Black Hawk*, and Cuban Black Hawk*. Great Black Hawk has no accepted records from the ABA Area, but it occurs rather far north into Tamaulipas, so it wouldn’t be an outlandish prospect to show up in southern Texas. (Records of this species from Florida have been treated as suspect.) Cuban Black Hawk has been recorded in Georgia, but that record was not accepted by the ABA CLC. This change in names is taking place because the “black hawks” are a paraphyletic group. That is, they are not each other’s closest relatives. Some black hawks are more closely related to other Buteogallus, such as Solitary Eagle*, than they are to other species called “black hawk”. ack hawks (above), the Phylloscopus leaf-warbers were found to be a paraphyletic group. So goes the hyphen. The genus Geotrygon (quail-doves) was found to be paraphyletic. Therefore, it was split into three genera. Ruddy and Key West quail-doves are still in Geotrygon, so the only consequence for ABA Area birders is a reshuffling of the sequence of some of the doves. Why the hyphen didn’t drop out of “quail-dove” I don’t understand. Coming after Spotted Dove, the new dove sequence is as follows. Green Parakeet is now Psittacara holochlorus. Harlingen, Texas. Photo by Michael Retter. The genus Aratinga was found to be paraphyletic and was split into four genera, three of which occur in the ABA Area. Additionally, the genus Nandaya was absorbed into the “new” Aratinga. All of the species listed below have current or former populations in the ABA Area. The new scientific names and the new checklist sequence are as follows. The Old World family Megaluridae has had its name changed to Locustellidae. Middendorff’s Grasshopper-Warbler and Lanceolated Warbler are the only species in this family on the ABA Checklist. Bronze Mannikin. Photo by gisela gerson lohman-braun. The estrilid finch genus Lonchura was found to be paraphyletic. Therefore, it was split into three genera. Also, the genus Padda was absorbed into the “new” Lonchura. The new scientific names and the new checklist sequence are as follows. 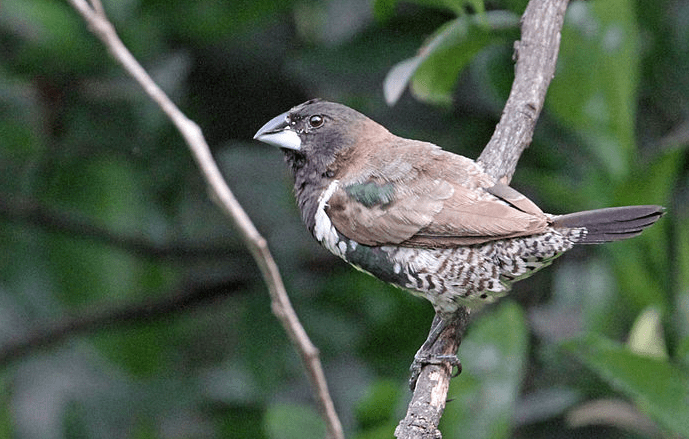 Bronze Mannikin is an African species with an established population in Puerto Rico; a small population also exists in the southwestern suburbs of Houston. African Silverbill is established in Hawaii. Java Sparrow is established in Hawaii and turns up as an escapee in California and Florida. Tricolored Munia has exploded in numbers across the Caribbean and Middle America over the last decade; in 2013 a presumed vagrant from Cuba turned up on Florida’s Dry Tortugas, whence come at least three prior records. 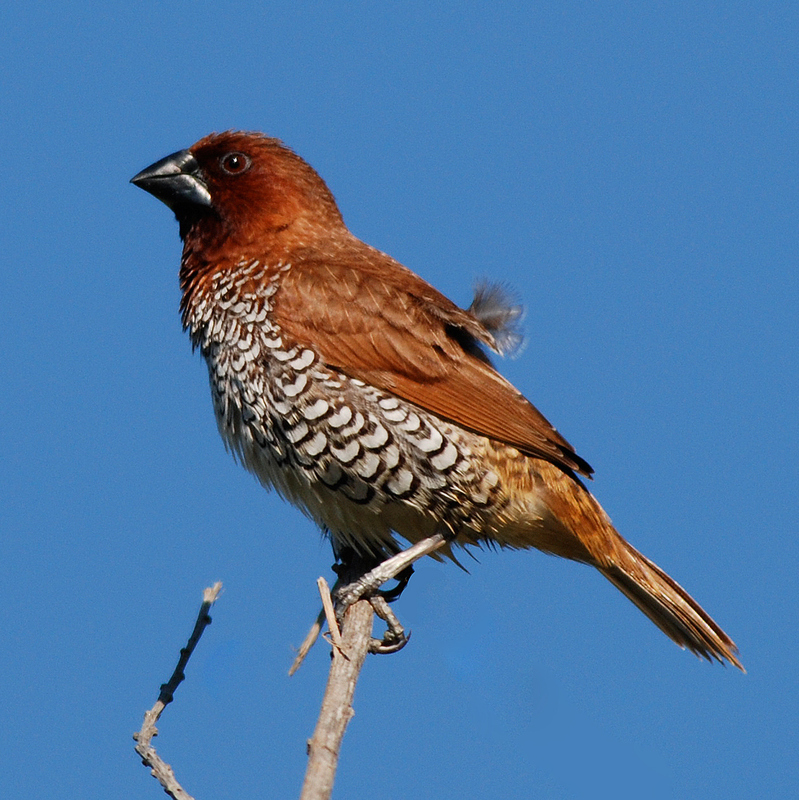 Chestnut Munia is established in Hawaii. Lump of Thick-billed Parrot and Maroon-fronted Parrot*. Split of Siberian Stonechat from Common Stonechat. Split of Curve-billed Thrasher into Plateau Thrasher and Palmer’s Thrasher. Transfer of American Goldfinch, Lesser Goldfinch, and Lawrence’s Goldfinch into their own genus, Astragalinus. Removal of Azure Gallinule* from the AOU Check-list. At least not in North America. 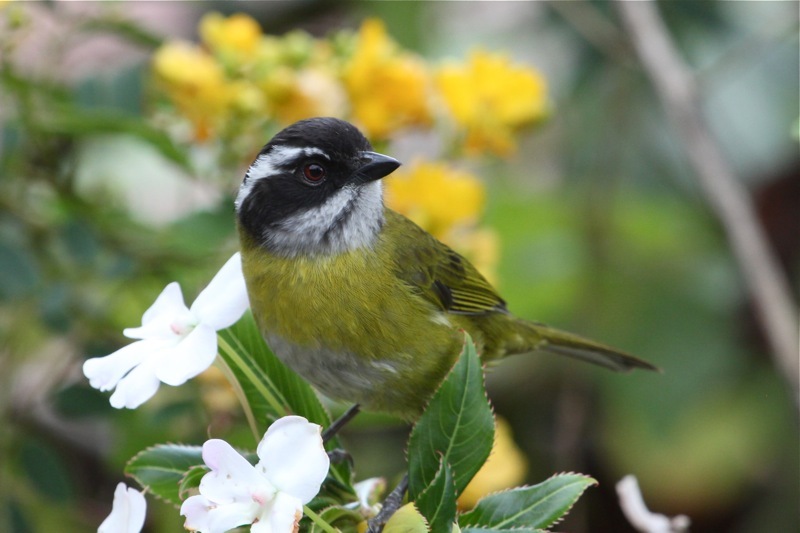 All the members of the genus Chlorospingus—which are not tanagers, but emberizid “sparrows”—have had their “last name” changed from “bush-tanager” to “chlorospingus”. Sooty-capped Chlorospingus. Savegre Valley, Costa Rica. Photo by Michael Retter. Guadalupe Junco is a severely endangered endemic of Mexico’s Guadalupe Island, off the west coast of northern Baja California. For a captivating look into this species and its unique home, be sure to watch this video. 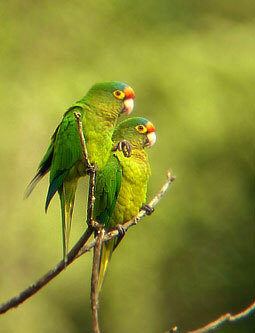 The endemic “Azuero Parakeet” (eisenmanni) of Panama is still treated as a subspecies of Painted Parakeet. 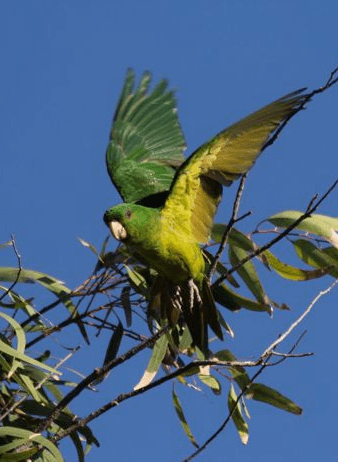 The other subspecies of the “new” Painted Parakeet are found in South America, as are Santarem, Bonaparte’s, and Rose-fronted parakeets. So there is no appreciable change as far as North America is concerned. Bicolored Antbird along Pipeline Road, Panama. Photo by Michael Retter. This is, unfortunately, an A = A + B split at the English name level and a B = A + B split at the scientific name level (as with Clapper Rail). The formerly lumped Bicolored Antbird was G. leucaspis. 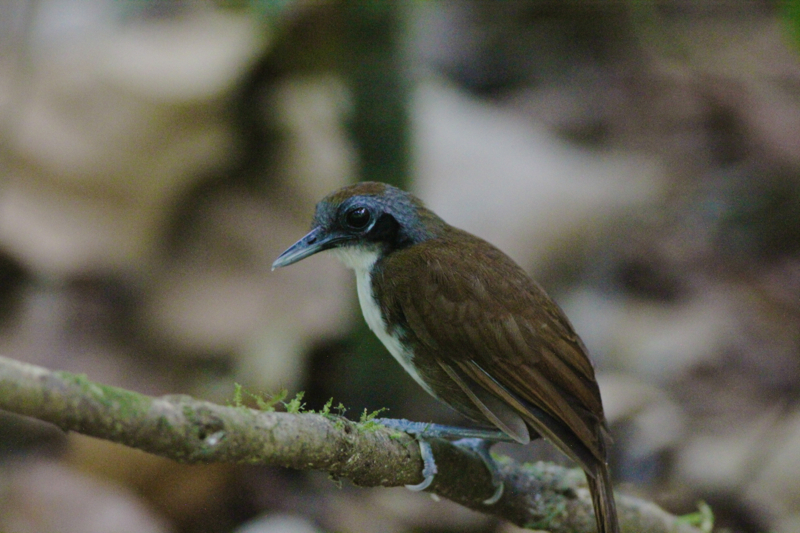 But G. leucaspis now refers to White-cheeked Antbird, found east of the Andes. The “new” Bicolored Antbird (G. bicolor), found west of the Andes, is the one that occurs in North America. Male Variable Seedeater in Chiapas, Mexico. Photo by Michael Retter. Like the preceding example, this is one where the English name stays with one species and the scientific name with another. Wing-barred Seedeater is not found in North America, so the major effect is a change in the scientific name of Variable Seedeater. The genus Geotrygon (quail-doves) was found to be paraphyletic. One of them (now Leptotrygon) is allied with Leptotila. Some others (Zentrygon) are allied with Zenaida. See what they did there? The new scientific names (when applicable) and the new checklist sequence are as follows, starting immediately after Spotted Dove. Buff-fronted Quail-Dove is now Zentrygon costaricensis. Monteverde Cloudforest Reserve, Costa Rica. Photo by Michael Retter. The genus Aratinga was found to be paraphyletic and was split into four genera. Additionally, the genus Nandaya was absorbed into the “new” Aratinga. The new scientific names (if applicable) and the new checklist sequence are as follows. Yellow-winged Cacique at La Bajada, Nayarit, Mexico. Photo by Michael Retter. 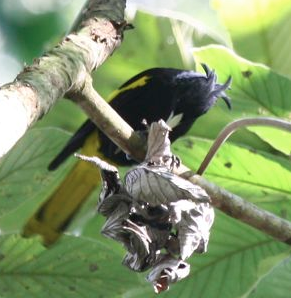 The pigtailed Yellow-winged Cacique—long known to literally be an odd bird—has been given its own genus. It changed from Cacicus melanicterus to Cassiculus melanicterus. 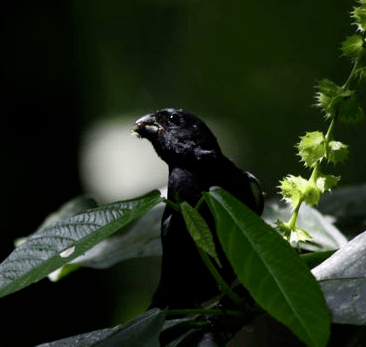 It seems to be from a relatively old lineage that predates diversification of many of the oropendolas and caciques. Transfer of the neotropical siskins (represented in North America by Yellow-bellied, Black-headed, and Red) to their own genus, Sporagra. Black-headed Siskin occurs quite far north in Mexico and is a good candidate to show up in the ABA Area. (There is an unaccepted record from South Padre Island, Texas.) This one was along the Durango highway in Sinaloa. Photo by Michael Retter.